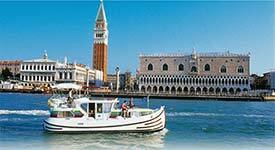 ABOVE: A self-drive Penichette from European Boating Holidays cruises past the San Marco waterfront in Venice, Italy. Choose from narrowboats of four different sizes, which are available at eight canal bases in England, Scotland, and Wales. If you aren't sure what's involved in being a DIY canal-boat captain, read The Boater's Handbook (PDF format), which was produced by British Waterways and the UK's Environment Agency. This firm has nearly 400 traditionally-styled "Penichettes" at more than two dozen European locations. Drifters, a UK-based company, represents a number of British operators. Its "check availability" tool lets you search for narrowboats, day boats, etc. on the waterway of your choice. France Plassion Plaisance has 31 departure bases in France, Belgium, Germany, Italy, Spain, and the Czech Republic. License-free, self-drive boats come in a variety of sizes, and "Handy" boats are available for wheelchair users. Rent a boat in Burgundy from H20, whose "home fleet" consists of boats that are used by their owners only a few weeks per year. The firm also represents Pavillon-Sa�ne, Nicols, and Crown Blue Line. This UK firm offers last-minute deals on self-drive boat rentals in Britain, Ireland, and France. This company's self-drive barges sleep 2 to 10 passengers and can be rented in France, the British Isles, Ireland, Germany, and the Netherlands.